Unsure of what our various products offer and how they work together? Read below or Contact Us. Sound Absorbers. These materials eliminate sound reflections and are generally porous, with many pathways that redirect sound and cause it to lose energy. Typical sound absorbing materials are fiberglass, rock wool, open cell polyurethane foam, cellular melamine foam, heavy curtain blankets and thick fabric wall coverings. 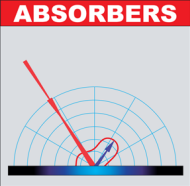 Absorber materials do not substantially block sound, but absorption can enhance isolation by stopping air movement that would otherwise allow sound and noise to travel. 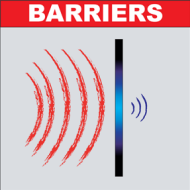 Conversely, flexible non-porous barriers can act as low-frequency, bass absorbers. Sound Diffusers. (Alt. 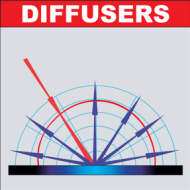 Diffusors.) These devices reduce the intensity of sound by scattering it over an expanded area, rather than eliminating the sound reflections as an absorber would. Traditional spatial diffusers, such as the polycylindrical (barrel) shapes also double as low frequency traps. 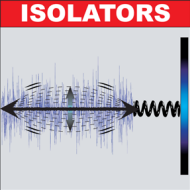 Temporal diffusors, such as binary arrays and quadratics, scatter sound in a manner similar to diffraction of light, where the timing of reflections from an uneven surface of varying depths causes interference which spreads the sound. Noise Barriers. These materials are heavy, dense and massive to prevent sound penetration. A common material is drywall (gypsum, sheetrock). Thin materials with high sound blocking characteristics are lead foil and mass loaded vinyl. A sandwich of dissimilar materials such as five-eighths inch gypsum, one- eighth inch vinyl barrier, and a half-inch finish layer of drywall will block more effectively than an equivalent thickness of drywall alone. More energy is lost as sound must change its speed for each different material. Sound Isolators. These devices are resilient and prevent sound transmission through the structural steel or concrete of a building as well as its plumbing and air handling systems. Typical devices are resilient channel for drywall, isolation pads for floors, de-coupling hangers for ceilings, and special adhesives for walls to avoid the hard connections of nails and screws that often provide a sound path through otherwise effective sound insulation materials. These items require diligent attention to detail when installing.